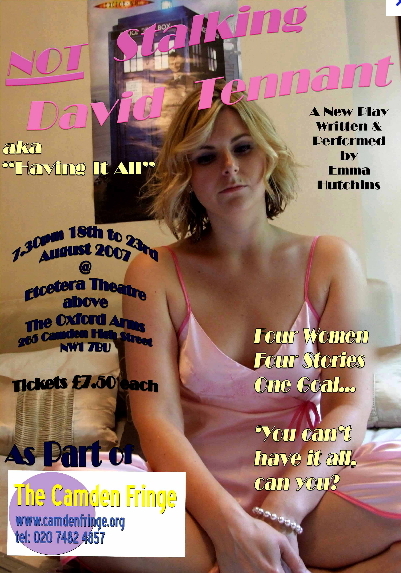 In March of 2007 performer and writer Emma Hutchins premiered her one woman show called Not Stalking David Tennant (aka Having It All) at the Woolwich Drama Festival. Her website describes the show as "Comedy, tragedy and a bit of Butoh powerfully united to evoke four women’s joys, sorrows and frustrations as they struggled to tick all the boxes whilst desperately asking: ‘Money, career, family, looks, love…. you can’t have it all, can you?’"
The show was so well received that she performed it again for six shows as part of the Camden Fringe Festival, also in 2007. She then updated the show to perform it at the 2008 Edinburgh Fringe Festival, where she got rave reviews from The Stage, The British Theatre Guide and many more. "While writing the play I was studying for a degree and doing a full time job. As a way of dealing with the pressure, I developed a minor league obsession with the actor David Tennant, purely as a distraction of course! When my friends found out that I had been researching his career on the net, tracking down his old work on DVD and travelling (once, just once) across the country to see him perform, they started to assail me with shouts of ‘Stalker!’ My response, ‘I am not stalking David Tennant!’ seemed to fall on deaf ears. My title and the final character are drawn from this experience and fellow Tennant fans will find much they can relate to in my show.’"
The first clip has the bit about David and the other longer clips show the 4 different women who are trying to have it all!